After meeting at a family wedding, a woman (Marie-Christine Barrault) and her distant cousin (Victor Lanoux) become friends and then lovers, while their philandering spouses (Guy Marchand and Marie-France Pisier) get increasingly jealous. This lilting French comedy — essentially a tale of romantic revenge — is listed as a cult movie in the back of Peary’s book, and was remade in 1989 as Cousins, starring Isabella Rossellini and Ted Danson. It’s easy to understand why American audiences were so taken with it, given that it represents a decidedly “European” approach to love and marriage — one which allows for an unconventional, free-spirited attitude towards extra-marital affairs. From the beginning of the film, we’re made to sympathize with the long-suffering Barrault and Lanoux, who accept their spouses’ philandering with an air of insouciant sadness — once they discover their attraction for one another other, we can’t help but cheer them on, because their spouses deserve to worry and wonder. A frothy souffle, but worth a look. First viewing. A once-must, as a particularly successful French comedy. ~and, by that, I don’t mean box office success, although I seem to recall it was very well-received at the time of its release. I’m very tough on French films, in general. I can’t exactly pinpoint the reason for that – except I often sense that a French film is either trying too hard or not hard enough. Or it will get it just right (as has sometimes happened with some films by Bresson and Truffaut, two filmmakers who aren’t particular favorites of mine). 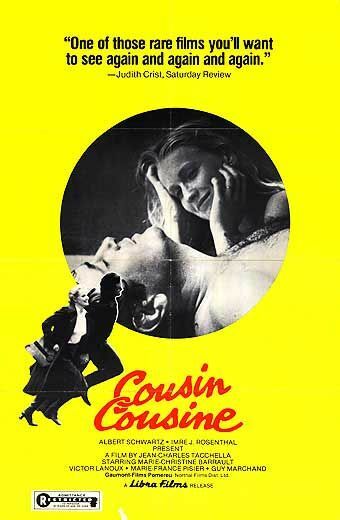 I can approach a French film with a sense of trepidation – as I just did with ‘Cousin, Cousine’. However – within minutes, I was already won over…and was held throughout. There’s a seemingly effortless breeziness about this film (often exhibited in the many instances of ‘snapshot scenes’ peppered for the film’s seasoning). The handful of main characters are drawn wonderfully and performed by actors who have slipped them on more than comfortably (esp. the very charming Barrault and Lanoux – I just loved watching these two individuals grow into each other). Although everything here is delivered in a light/frothy manner, even the few sequences of ‘darkness’ fit into the whole seamlessly. What occurs leans towards farce but what we witness consistently reads as real and believable, the slight exaggeration notwithstanding. The loose, episodic script is also very clever in periodically giving us little breaks in the main narrative by suddenly shining comic light on some of the peripheral characters. Mainly I admire the fact that none of this comes off as forced entertainment. The proceedings are infused with a natural air that is often downright giddy. A thoroughly enjoyable and satisfying romp!